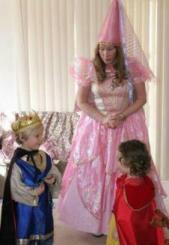 CATRIONA'S CASTLE Hands-On CHILDREN'S THEATRE - Fairy Tales & Classics since 1988! 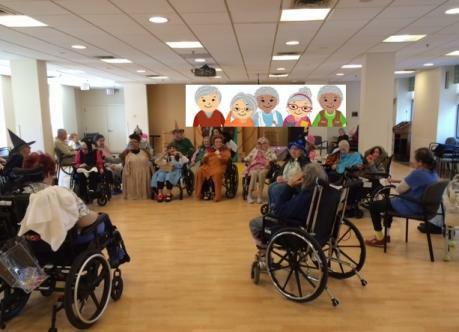 also Adult Seniors Residence Shows -The Wizard of Oz, Alice in Wonderland, and Peter Pan - Adult size costumes and program adapted to fit residents using wheelchairs and walkers - Fun for Memory Care & Alzheimer's residents. Choose from 18 Fairy Tales and Classic Stories: Cinderella, Snow White, Peter Pan, Sleeping Beauty, Alice in Wonderland, Robin Hood, Treasure Island, Goldilocks, Dinosaur Castle, Nutcracker, Secret Garden, Nursery Rhymes, Magic Flute, Jack and the Beanstalk, Wizard of Oz, The Snow Queen, Rumpelstiltskin, and The Three Little Pigs! 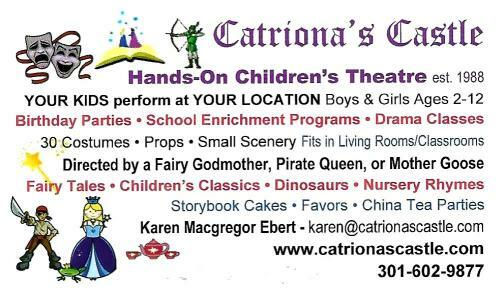 Celebrity favorite Catriona’s Castle brings unique interactive children’s theatre to homes, schools, and other locations for birthday parties, school enrichment programs, drama classes, and events. Fun for girls and boys ages 2-12. 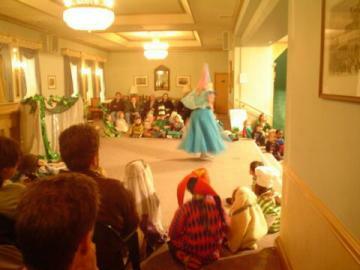 Theatre fits in living rooms, recreation rooms, clubs, or classrooms. 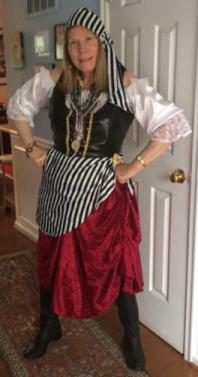 Thirty children can be costumed, with kid-size scenery and props, directed by Fairy Godmother, Pirate Queen, or Mother Goose. 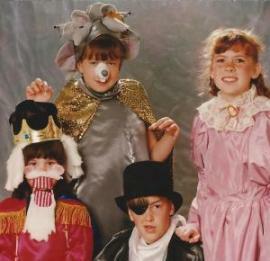 The birthday child is costumed as the main character with guests costumed as other characters. 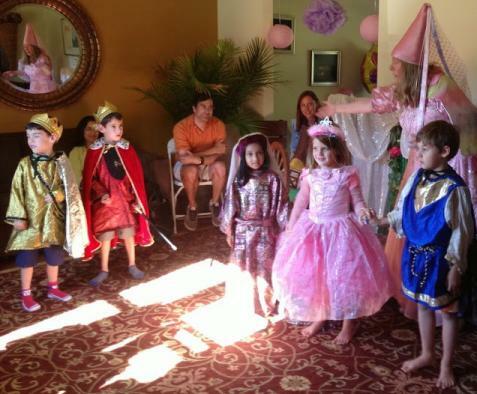 Scene from Robin Hood For birthday parties, the birthday child is cast as Robin Hood. 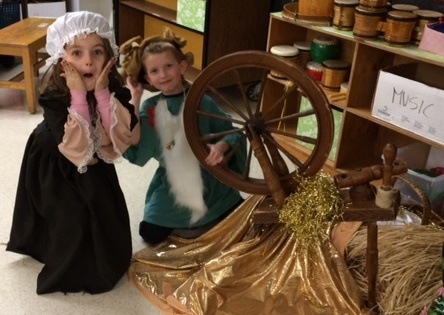 30 Costumes include Robin, Merry Men, knights, guards, Friar Tuck, King Richard, Castle, greedy Prince John, evil Sheriff of Nottingham, Maid Marian, ladies in waiting, townspeople, and archers...plus the play includes lots of GOLD! 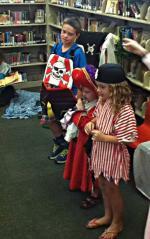 Cozy library performance of Peter Pan . Small-scale theatre fits most any venue including home living rooms, family rooms, recreation rooms, public libraries, classrooms, clubs, party rooms, school cafeterias, etc. 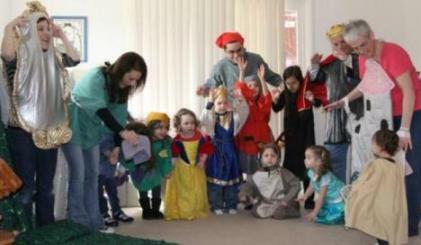 Up to 30 children can be costumed for each of our 16 stories - with audience participation for larger groups. 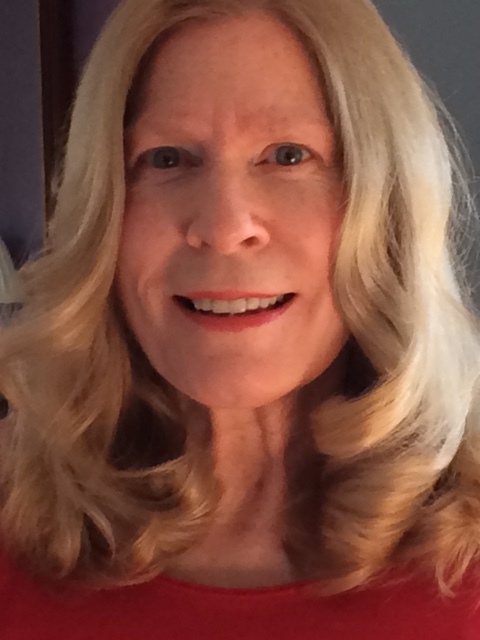 Karen Ebert "Catriona" has years of experience working with special needs children and the theatre program adapts easily to special needs kids. 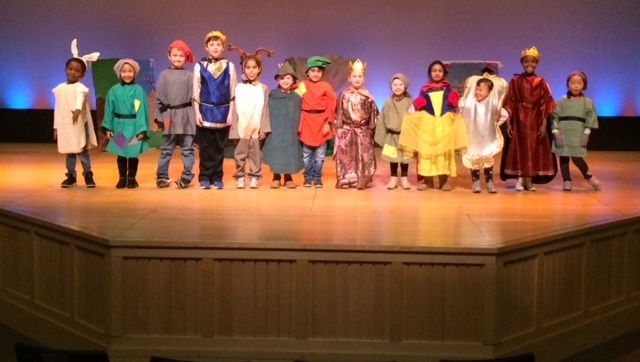 Catriona's Castle performance at the National Theatre Saturday Children's Series during a production of Jack and the Beanstalk, in the Helen Hayes Theatre. 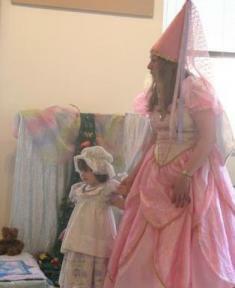 Approximately 30 children, from the audience, were chosen at random, to perform the story with Catriona, the Fairy Godmother. 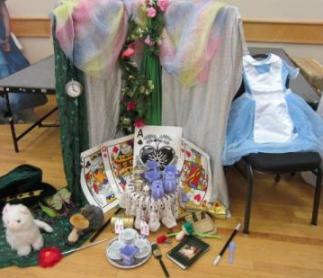 Typical Theatre set up - The Secret Garden, The Sleeping Beauty, The Wizard of Oz , and Jack and the Beanstalk. Each story has fun kid-size scenery. 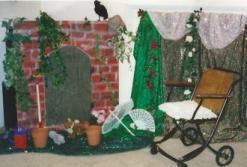 The Secret Garden has a garden wall complete with garden gate door that opens and antique wheelchair. Cinderella has a pumpkin coach. 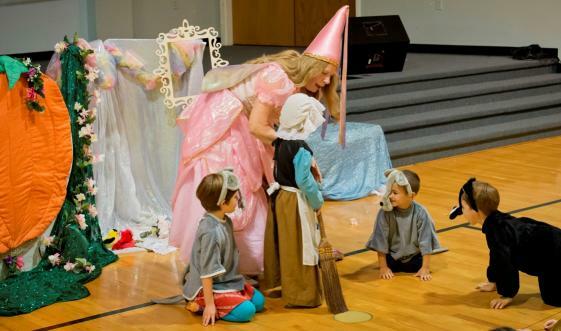 The Fairy Godmother whisks off the soft-sculpture pumpkin, revealing a coach, complete with door that opens. 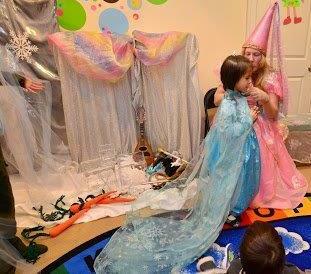 Cinderella goes through the door and has the illusion of going to the ball! 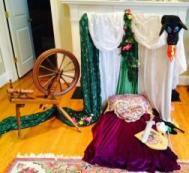 The Sleeping Beauty has a bed and full spinning wheel. The Wizard of Oz has a winding yellow brick road. 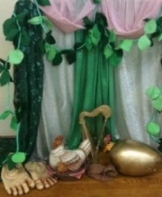 Jack and the Beanstalk has a long, winding beanstalk and a giant golden egg. 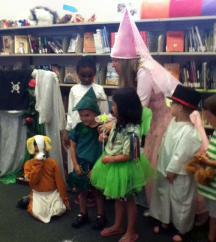 Kids raising hands before costuming a story. 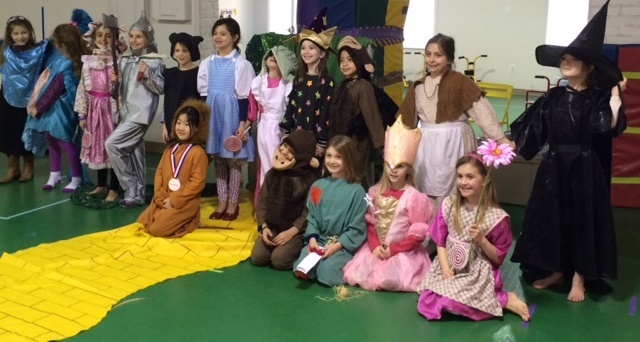 Classroom performance of The Secret Garden. 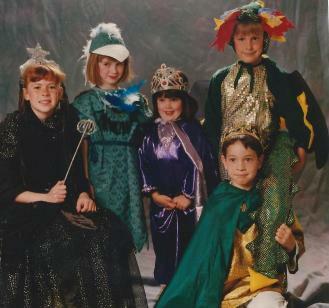 Some of the cast of The Magic Flute, adapted from Wolfgang Amadeus Mozart's opera fairy tale include Prince Tamino, Princess Pamina, Papageno, Queen of the Night, and the dragon. 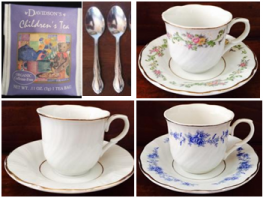 Delicious Storybook Cakes are available in two sizes. Standard serves 24, Large serves 48. 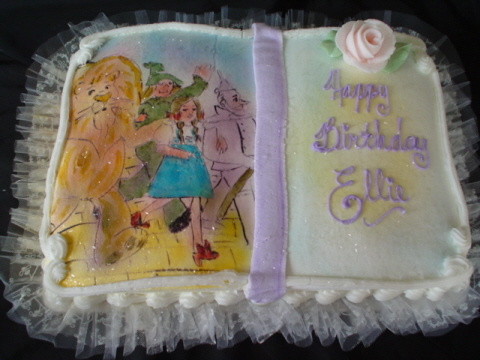 All cakes are in the shape of an open storybook, sprinkled with confectionery "Fairy Dust" and placed on a ruffled cake board. We contract a licensed professional bakery, Custom Cake Design, to provide cakes for Catriona's Castle. Disclaimer: Catriona's Castle does not represent nor do we have any affiliation with the Walt Disney Company or any of its subsidiaries. 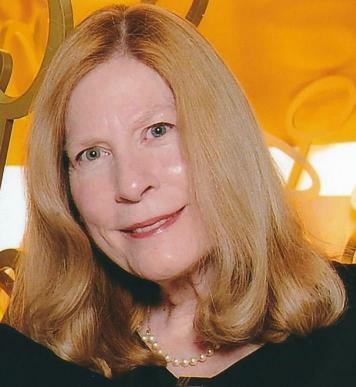 Serving Montgomery County MD: Barnesville, Bethesda, Brookeville, Chevy Chase, Damascus, Drummond, Friendship Heights, Gaithersburg, Garrett Park, Germantown, Glen Echo, Hyattsville, Kensington, Laytonsville, Martin's Additions, Montgomery Village, Olney, Poolesville, Potomac, Rockville, Silver Spring, Somerset, Oakmont, Takoma Park, Washington Grove. We thoroughly enjoyed the dramatics and storylines.